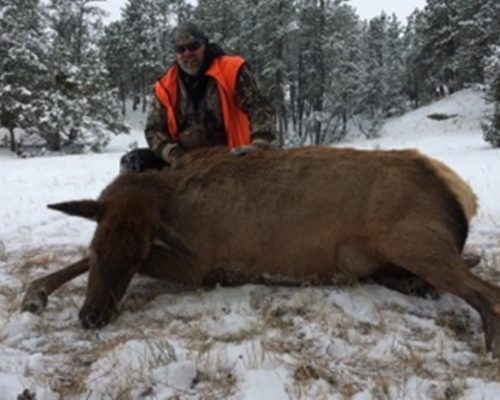 We thought we were done for the season with hunting and we received a call about a cow elk hunting opportunity on a private and very lucrative ranch. 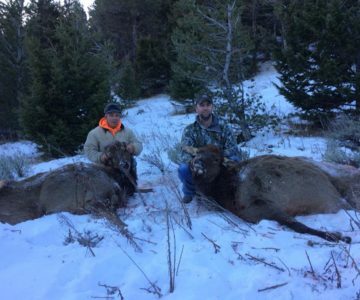 So on very short notice we called up two Warriors who started the season with us this year on an archery bow hunt for elk. 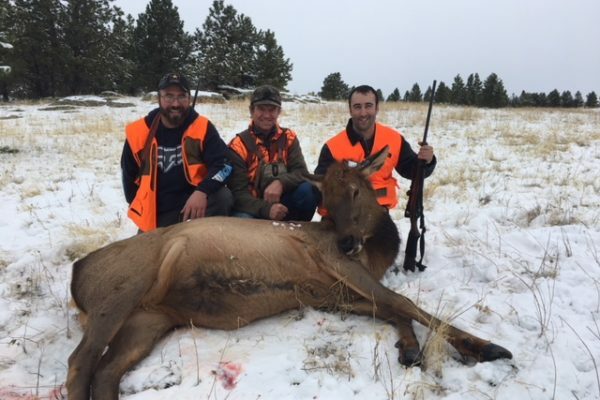 Mike Bossen and Chad Kiernan did the first hunt of the season with us and we were unsuccessful, but worked their butts off as the weather was not ideal. They were eager and made sure they were available for this opportunity. 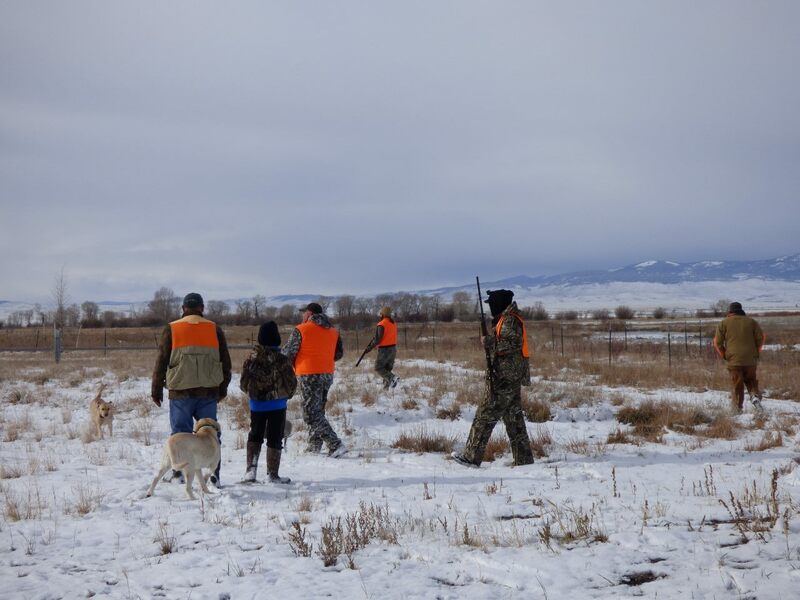 We met up with the Warriors and met the guides for the first time and went right to business down the road. 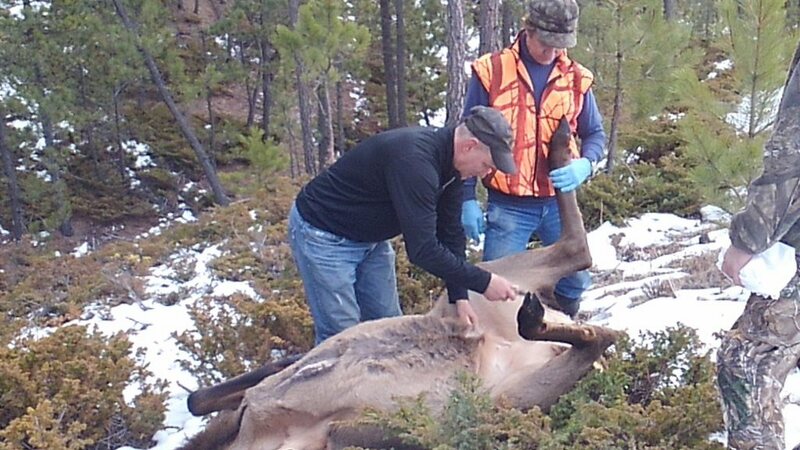 They took us directly to the spot where they saw elk the night before. 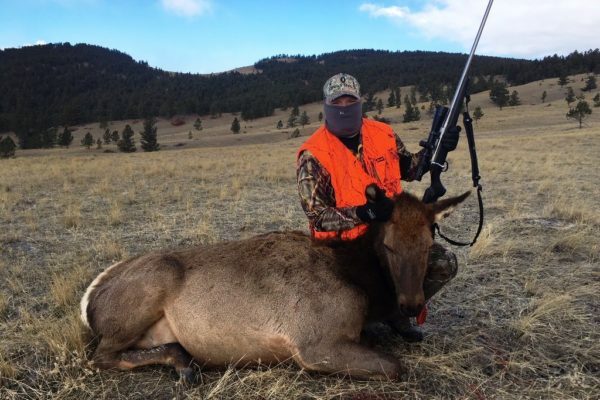 To no surprise, there were several dozen elk out on the hillside grazing. We hopped out and started to sneak on the herd with two very eager and excited Warriors. 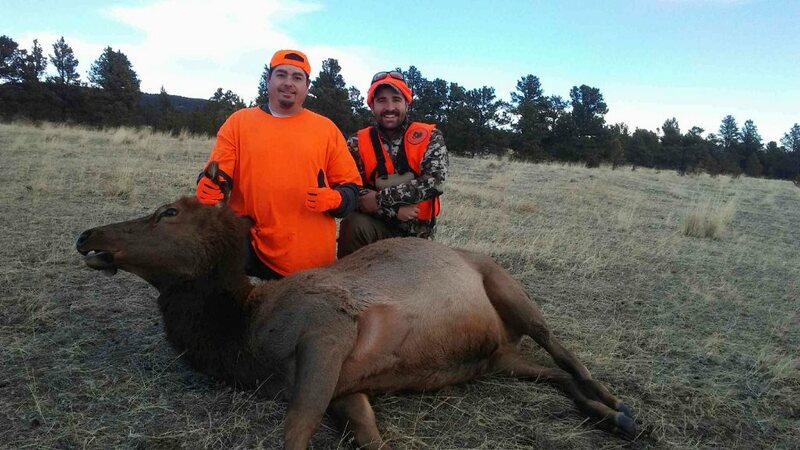 The awesome guides got us right on some small bulls but we needed cows so we had to move to the bigger part of the herd. 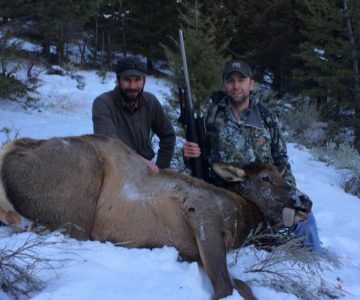 They got the Warriors within 200 yards of the elk just on the opposite hillside as Mike and Chad both got into position to shoot. Through the trees was constant cow calls and talking. 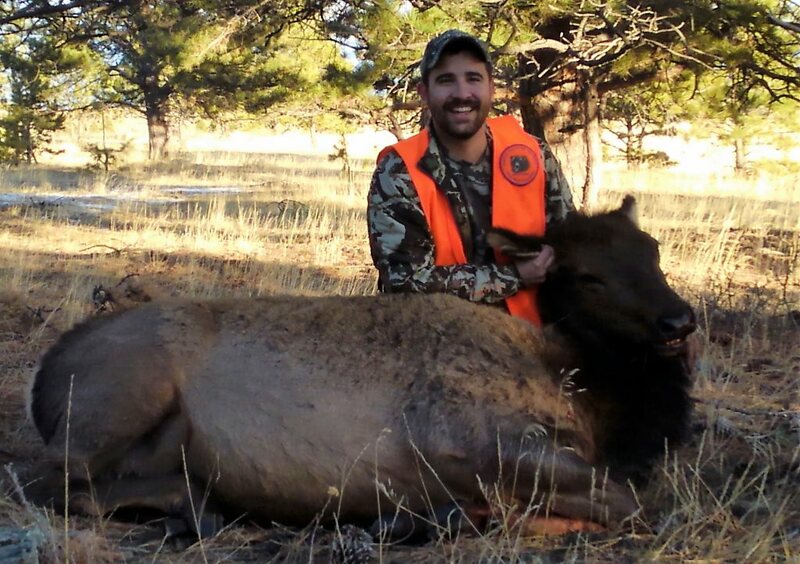 Once there were two cows in the clear both Warriors shot and dropped their cows almost 20 yards apart. It could not have worked out better. 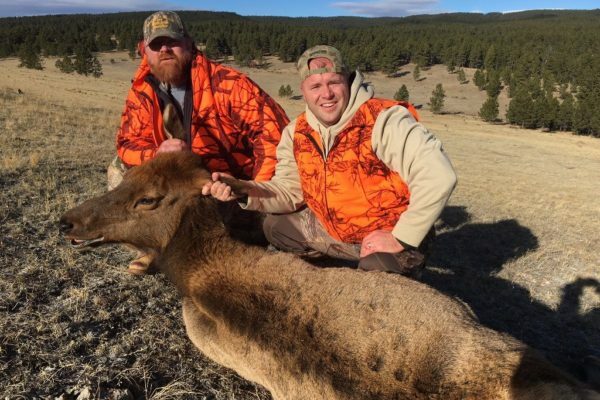 The Warriors were thrilled as they shot their first elk. To make it even better, the guides went and grabbed an ATV and pulled the cows out to the truck for us. 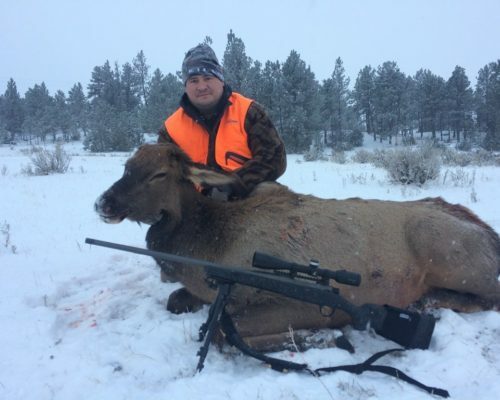 Considering how hard Mike and Chad had to work during the archery season, this was a perfect ending for a great year for them and Montana Wounded Warriors was honored to be a part of it with them. 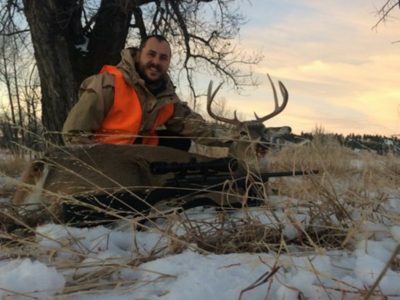 This was the first year that we tried our hand at this opportunity, as Sidney MT has a surplus of mule deer does all over. So we were contacted with access to several plots of land from local landowners. 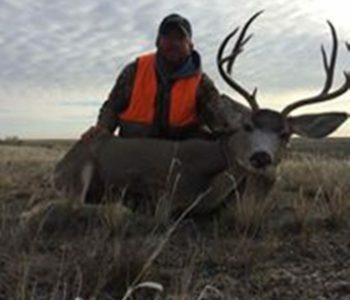 We took some Montana Wounded Warriors for the weekend to thin the mule deer population. The Warriors available on short notice were Chris Grudzinski, Ethan Bailey, Dean Murray, and Josh Beckett. The Warriors all carpooled up there and the fun started before we even got to start hunting with this group. We finally arrived and met up with the awesome landowner and got a quick tour of the land before we could start harvesting. 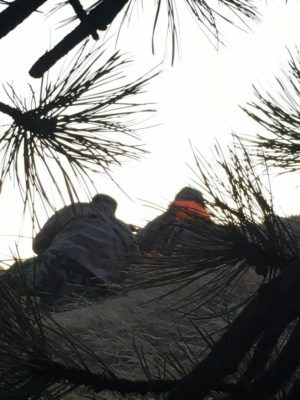 It was too dark the first evening to begin the hunt so we went back and unpacked and had a fun dinner and spent the evening hanging out and talking about the good old days followed by relentless teasing. 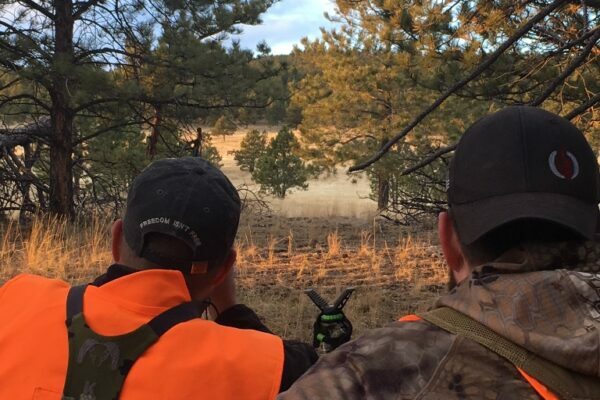 Well the morning came too early and we were up at it trying to thin the herds. 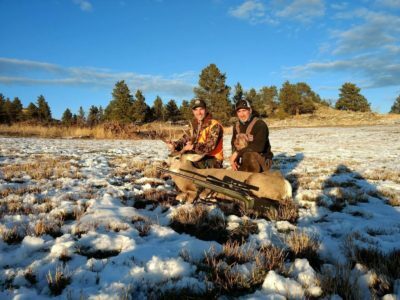 The first deer we spotted was a nice mule deer buck walking alone and Chris was eager to squeeze the trigger, so he put the stock on and dropped the nice deer to get the morning started. 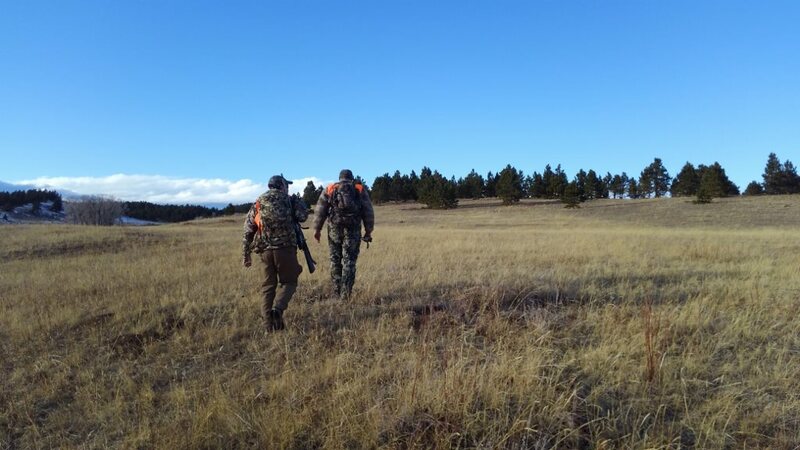 We headed down to the next plot of land and started glassing all the coulees. 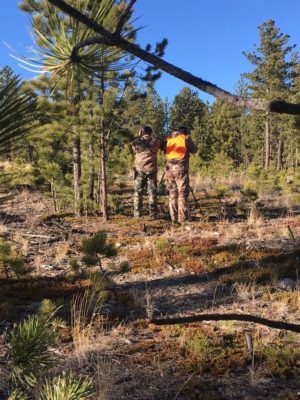 Ben and Dean were out on the ground and dropping deer across the other side. 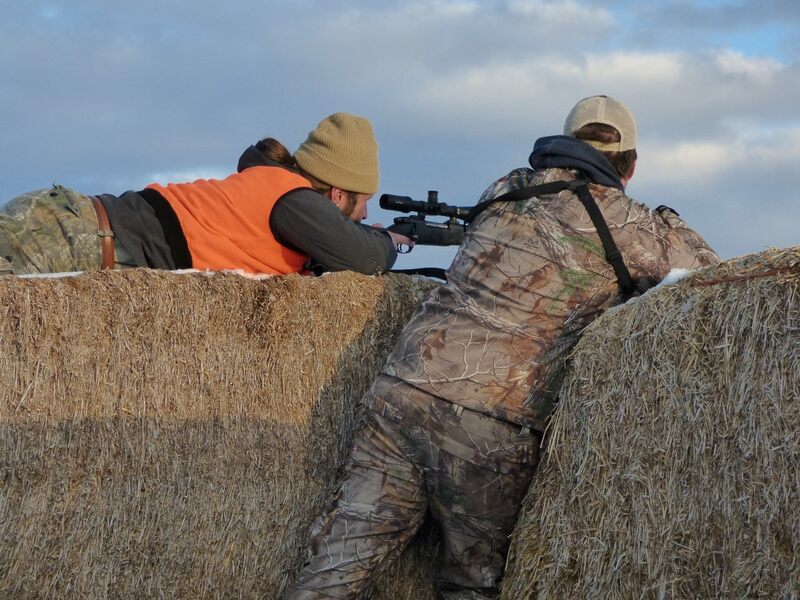 It was a blast watching them shoot at such long range. 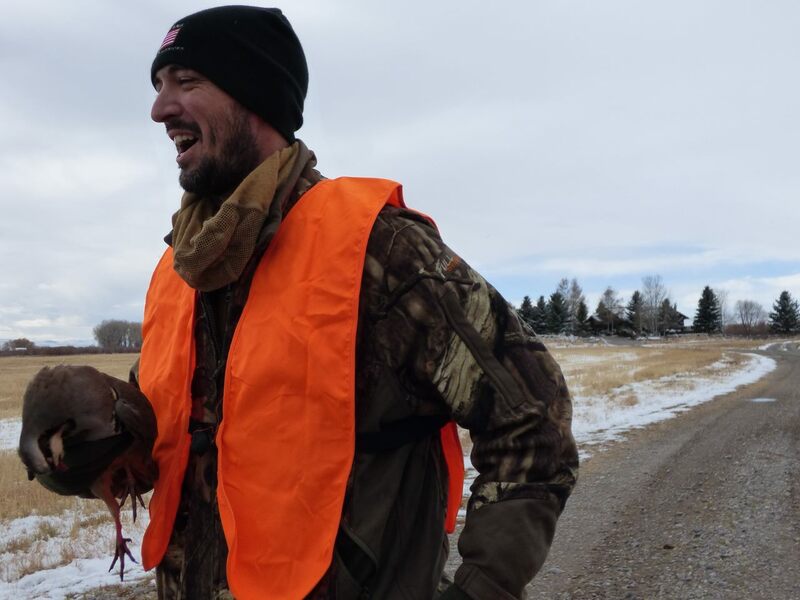 We tagged four more deer and headed to lunch. 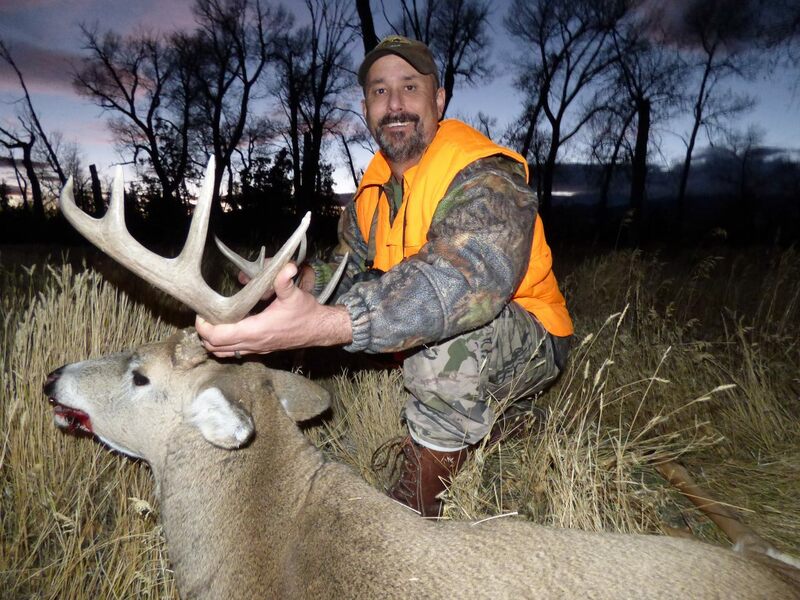 That evening we went out again and Dean shot a nice big mule deer buck as the others shot three more does to end the night of hunting. We went back to the shop, ordered pizza and boned out the meat from the days harvest. 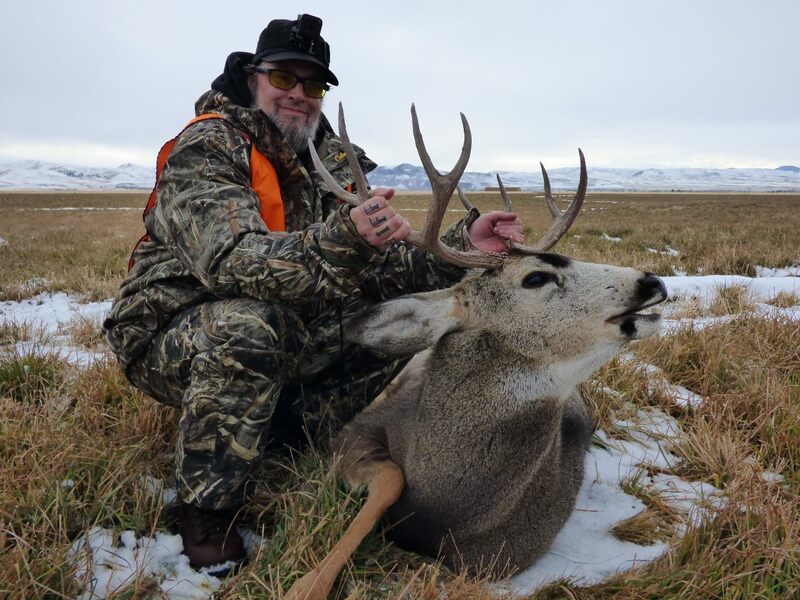 That next morning we went out and started off fast with taking a nice whitetail buck and a doe. 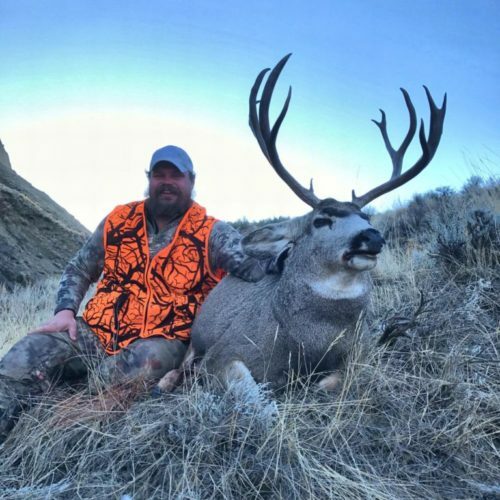 We went around and hunted some more coulees to finish the day out with another 5 deer. 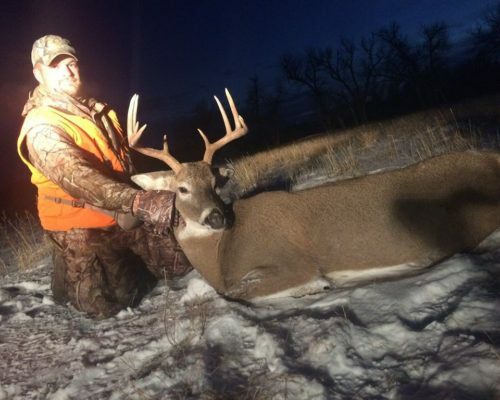 We ended up with a total of 12 deer harvested to take home. 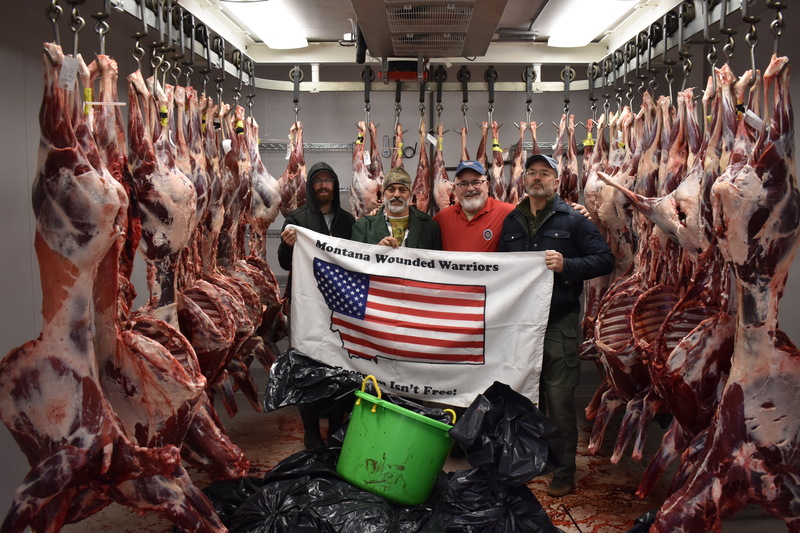 The Warriors all decided to donate their deer meat to the Montana Veterans Meat Locker to help feed Veterans in Montana. We had a great trip and this was a great group of Warriors that really benefited from this trip. It was a long weekend but well worth the trip. 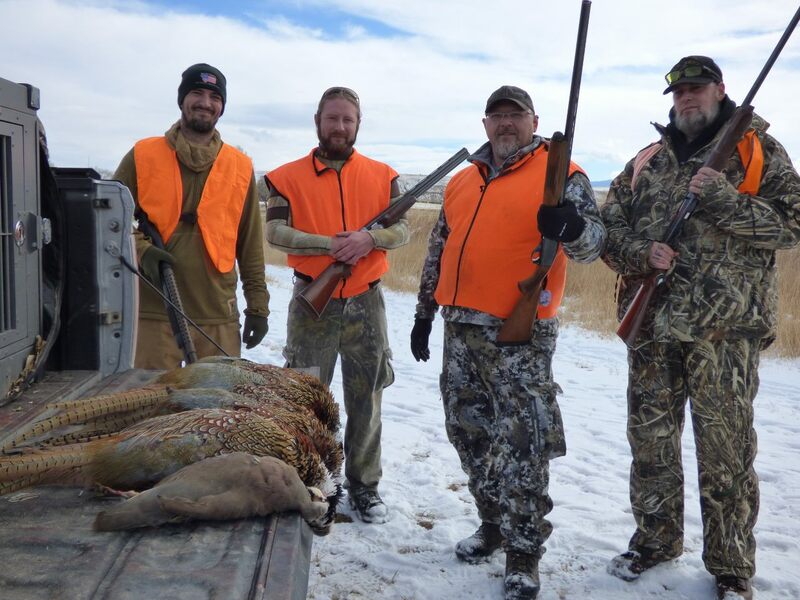 We look forward to doing this trip again with a brand new bunch of Warriors next year and to include some pheasant hunting. 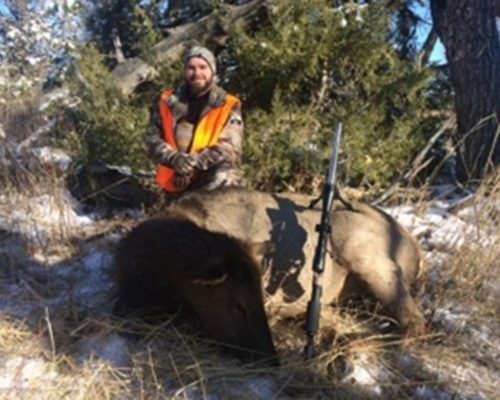 Over the summer we were contacted by Alan Peterson about hunting at the AG Ranch, located east of Big Sandy. 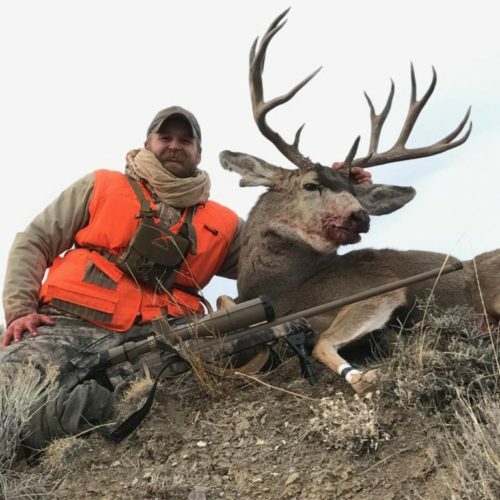 He told us there were lots of mule deer and that after our vets had filled their deer tags, they could hunt pheasants, waterfowl, coyotes and prairie dogs. 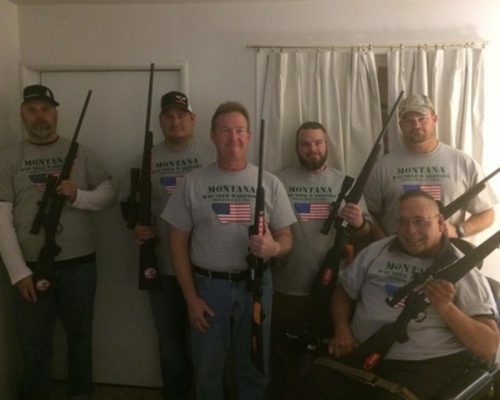 It sounded like a good opportunity to get a couple of wounded vets out into some new country. So we made plans to head over to the AG Ranch just before Thanksgiving. When we arrived, we could see immediately that the wildlife was plentiful. We were also extremely impressed with the beauty of this piece of ground along the Missouri River. 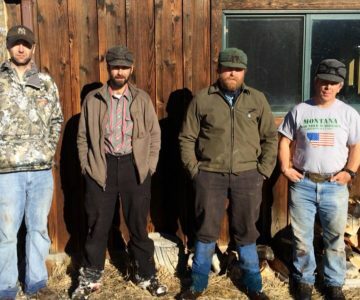 The first night we were guided by Phillip Russell who took us up along Birch Creek to get the lay of the land. 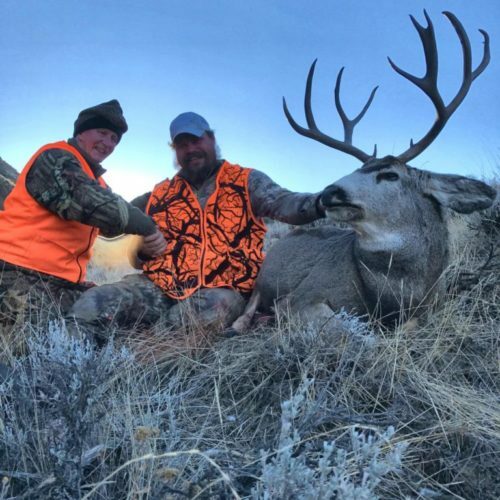 The two veterans we brought, Mackay Mathiason and Brandon Olsen, both from Billings, saw lots of deer, but realized they were in a special place and if they were patient, they would be rewarded with a trophy mule deer. So the first night, no shots were fired. 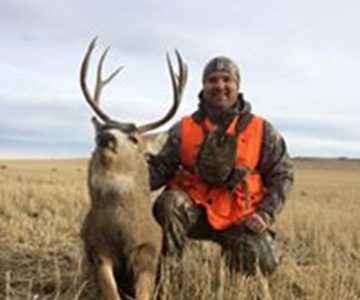 The next day, Alan Peterson’s friend, Lloyd Parson, gave us an even more extensive tour of the ranch where we not only saw many deer, including one our hunters wished they had gotten a shot at, but multiple herds of Missouri Breaks bighorn sheep, which was really exciting for our vets. 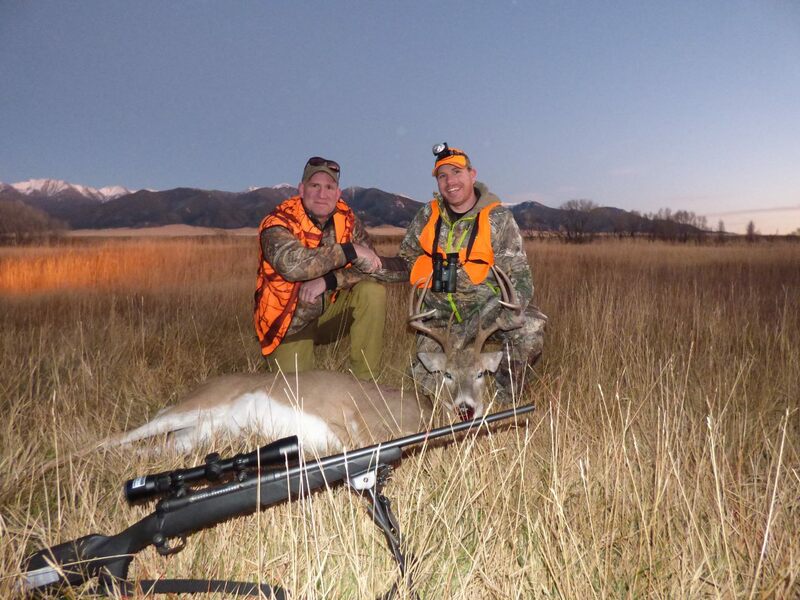 The day ended with no deer harvested, but with high hopes for Saturday. 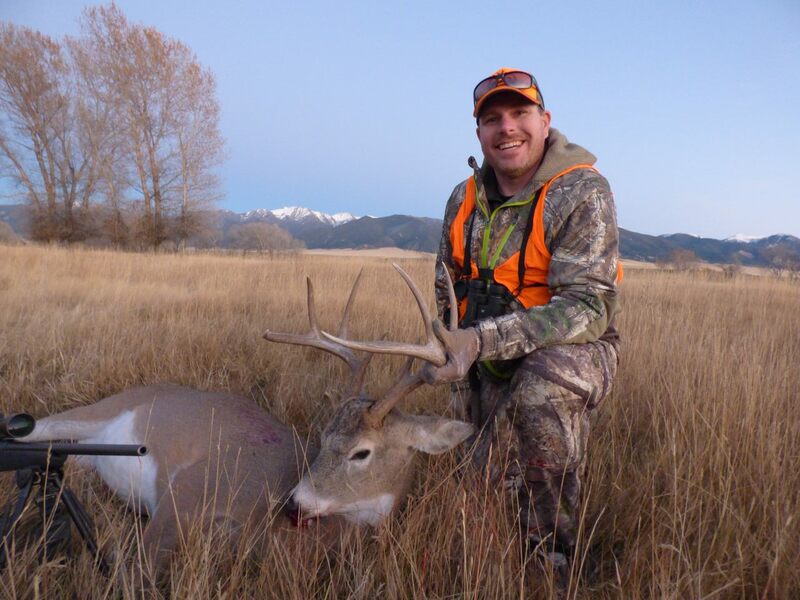 Early Saturday morning, Mackay shot a beautiful deer just as the sun was coming up. 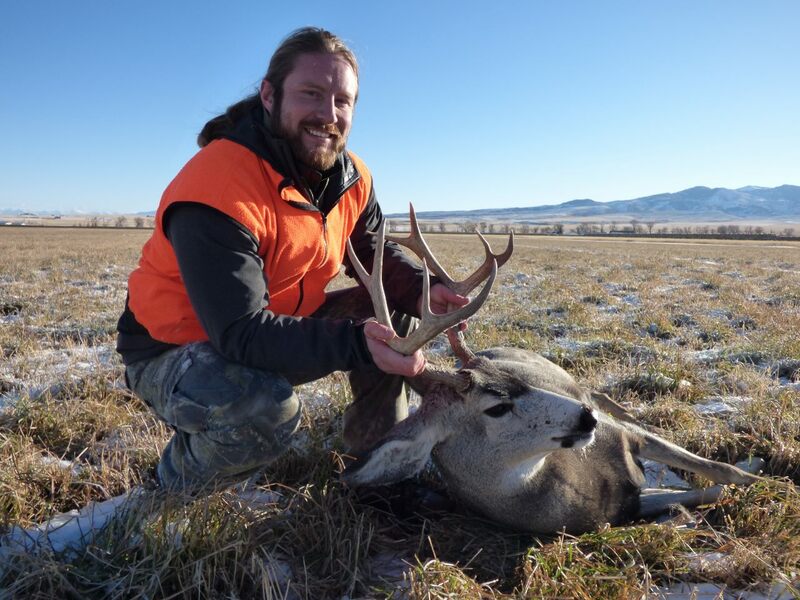 Then later in the day, Brandon saw the deer from the day before and was able to kill the biggest mule deer any vet has ever taken on one of our trips. 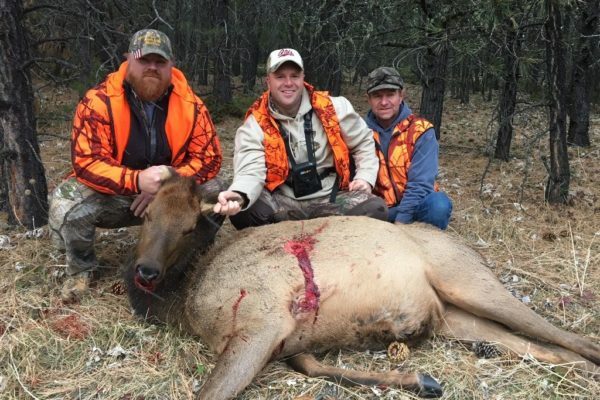 This was an awesome trip for our wounded warriors, and we can’t thank Alan Peterson enough for the opportunity to hunt the AG Ranch. 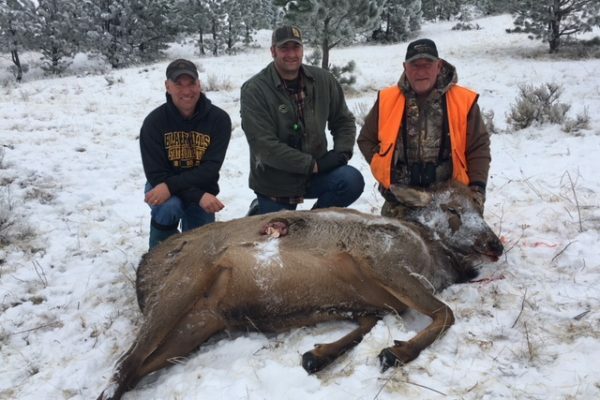 Alan, a veteran himself, said he was looking for a way to give back to our younger veterans, and he was very successful in the eyes of these two soldiers and Montana Wounded Warriors. 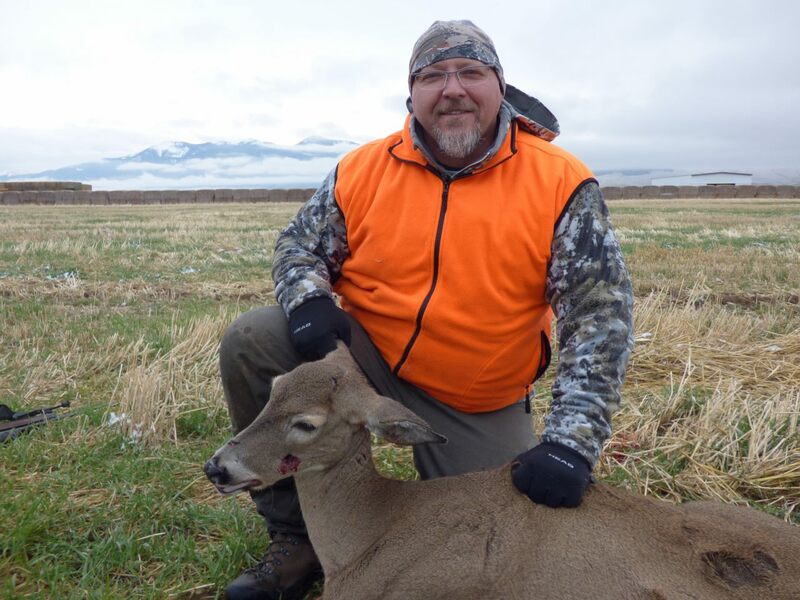 Thanks to Lloyd Parsons for providing us with his camper so we had a roof over our head for the weekend, and for his extensive knowledge of the ranch and where to find the deer. Thanks also to Phillip and Laura Russell for their help and hospitality while we were at the ranch. 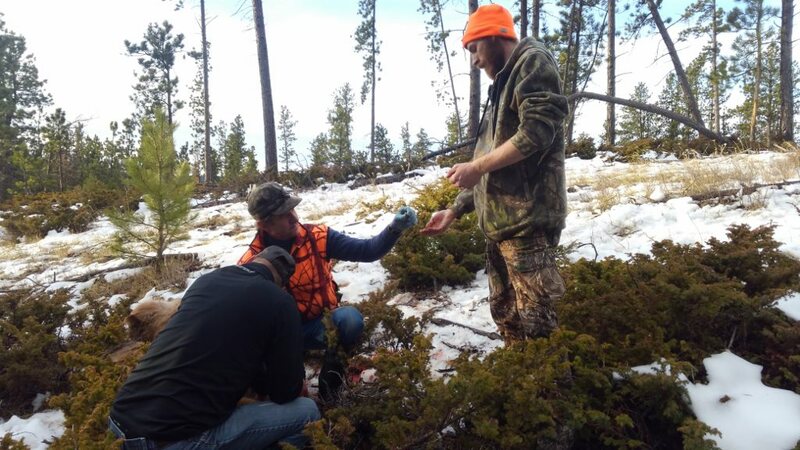 They not only helped the guys hang their deer, but provided some beer to help with the story telling that goes along with the hunt. They also cooked our vets a nice steak dinner. 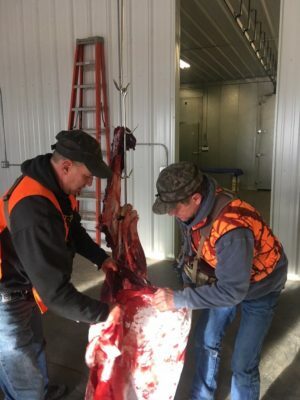 We would also like to thank Bruce and Pete Vasboda for loaning us their side by side to help the guys get around the ranch and haul out their deer. 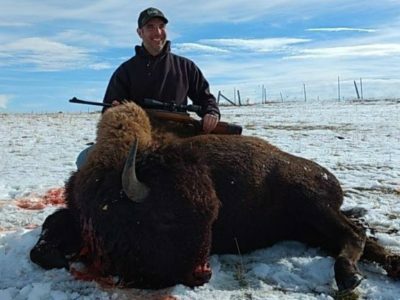 It was a great trip all around, and we look forward to returning to that part of the Missouri Breaks in the future. 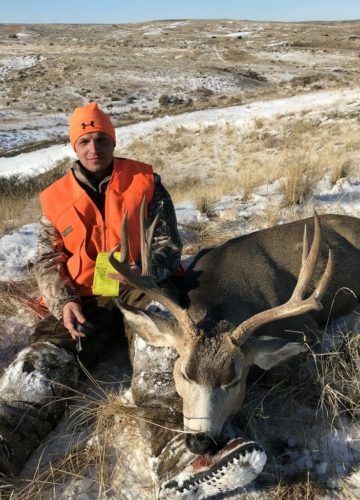 As the season chugged along I was focused on getting my twelve year old son his buck, but in the back of my mind chomping at the bit for the 16th of November to come. 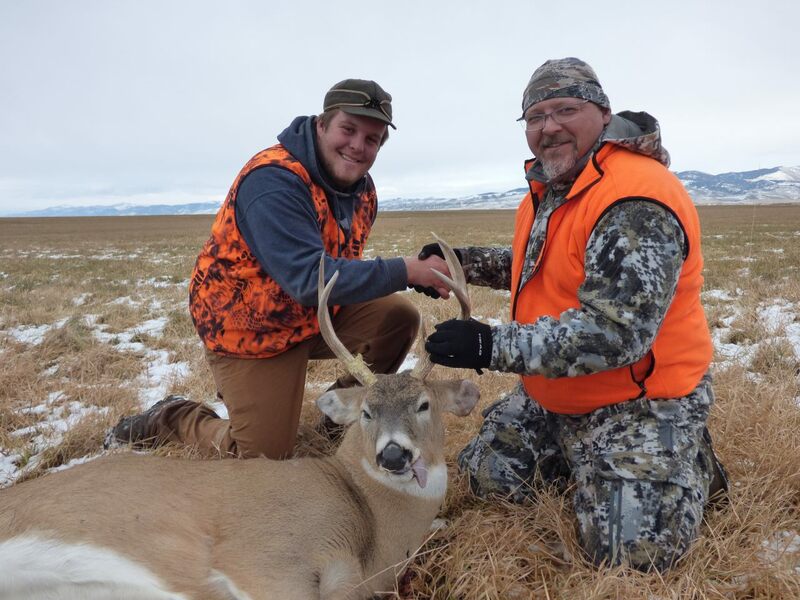 With the success of my son getting his deer, it was nearing the 16th, which meant it was my turn. 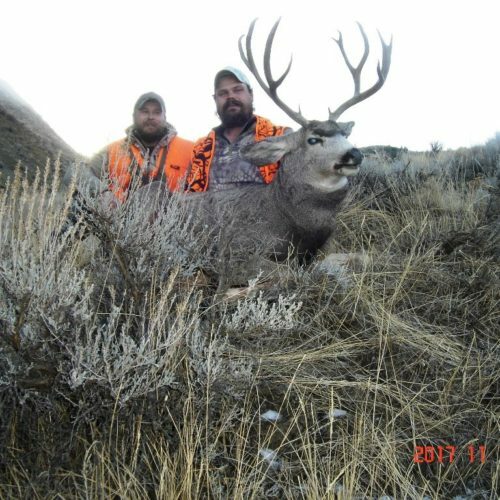 Neil Baumann (board member of MTWW) had asked me to be a hunter on a new ranch that we heard had some phenomenal deer. 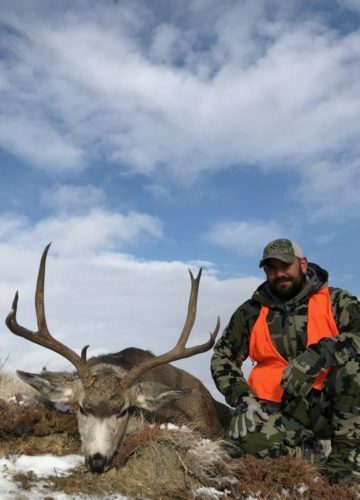 The hunt was everything I expected and more. We saw so many big deer and sheep it was insane. 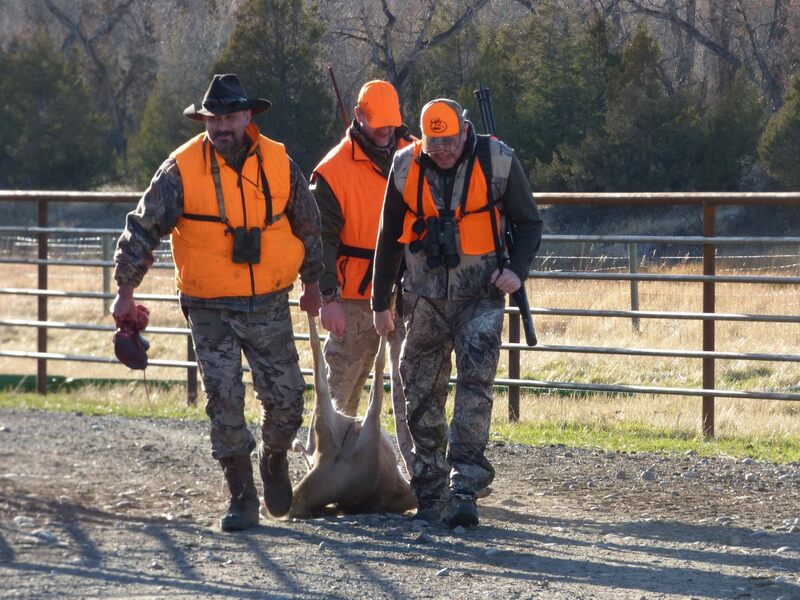 Being able to spend that hunt with people you love and that have inspired you to do better and be better was priceless. 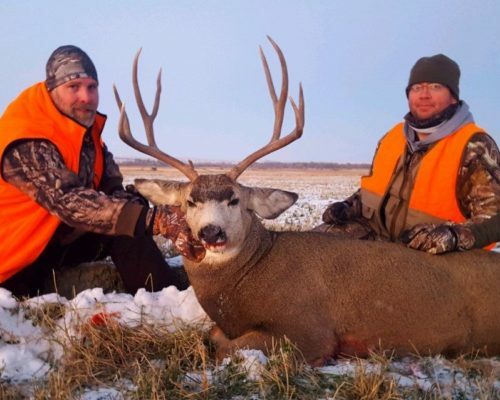 On this hunt we harvested the biggest deer that a warrior has ever shot on any of these trips! An absolute TOAD! 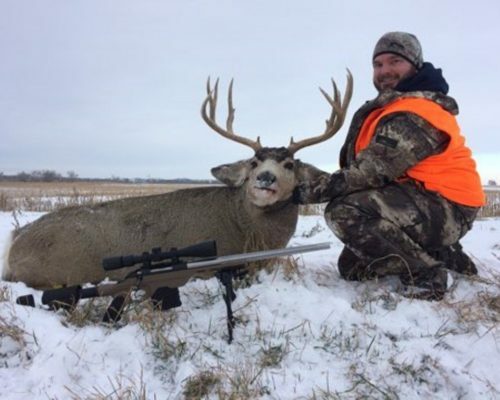 Even though I wasn’t that vet, I shot probably my personal best deer to date! 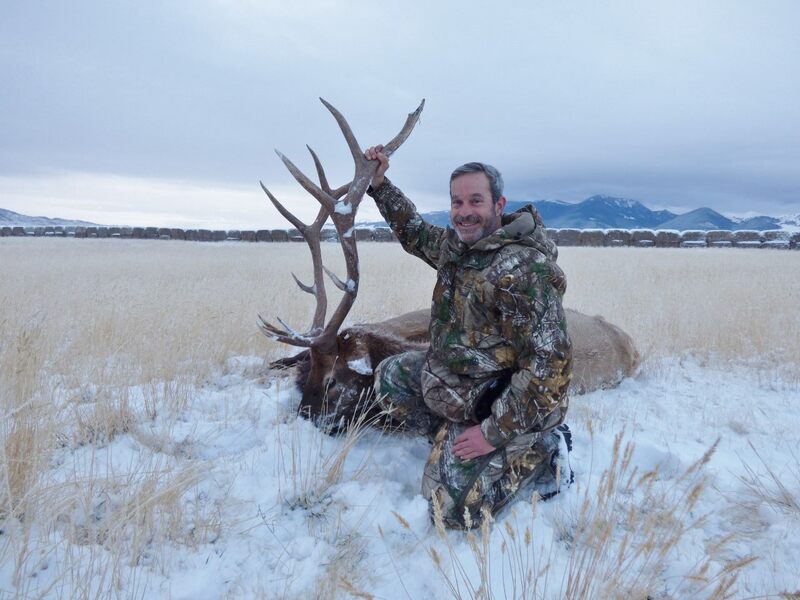 What an epic hunt that was because we all shot beautiful animals and will cherish that hunt in our minds for years to come. 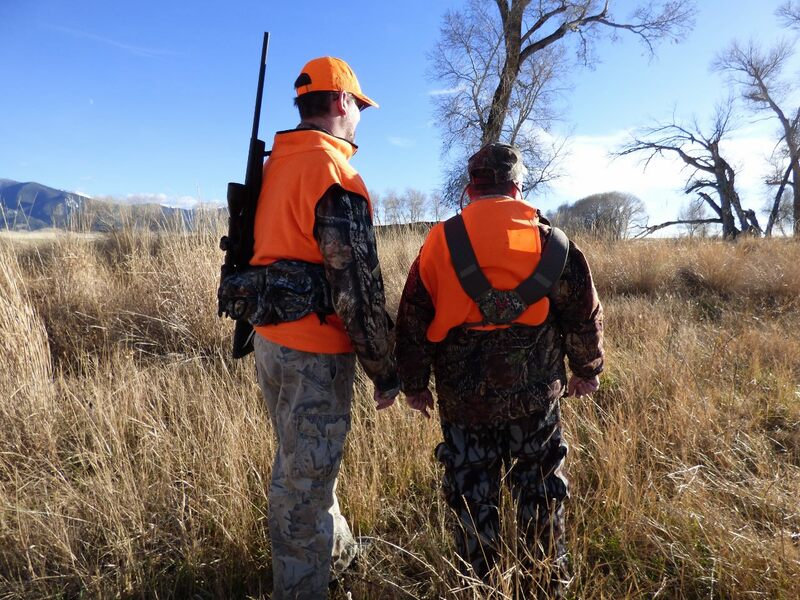 These hunts help so many different people in so many ways. They have helped me personally and professionally by being surrounded by such caring people. I know that they help vets by giving them a sound board and people that truly understand what they’re going through. I have seen how this affects volunteers that are not veterans but people that care about giving back. 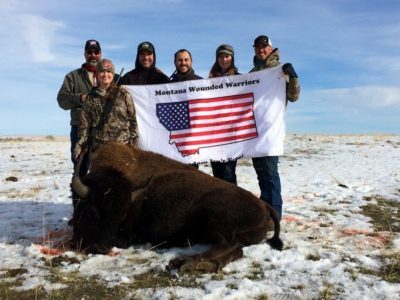 These hunts mean the world to so many veterans and it continues to help vets in need of something in their life. I heard it on every hunt this year. How it has changed their lives and how they can’t wait to help out wherever needed. That makes me know that I’m still a part of something greater than me. Just as we all knew in the military. 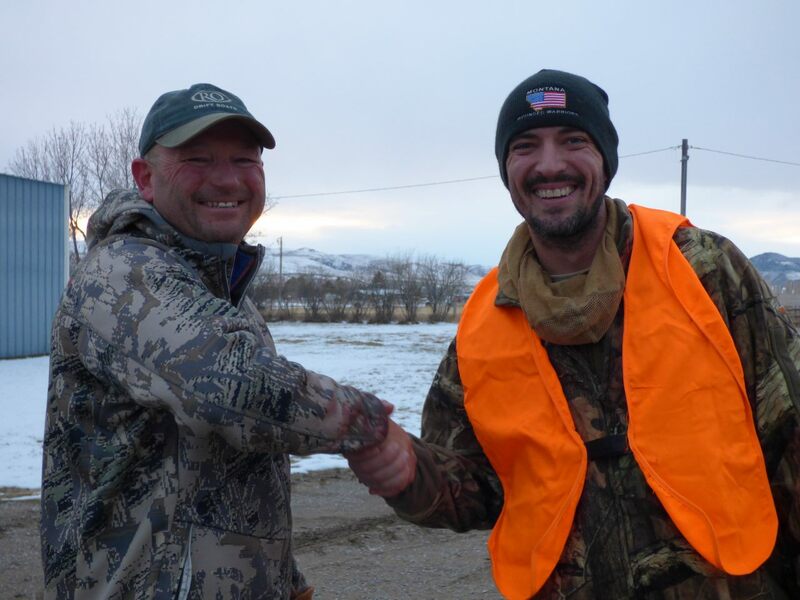 Thank you Montana Wounded Warriors for allowing me to take part in another great year! 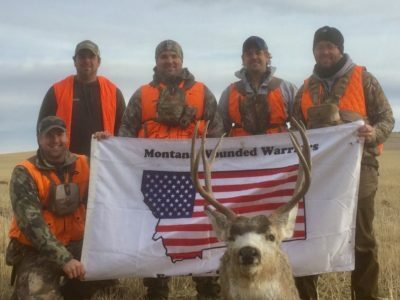 To everyone that supports or donates to Montana Wounded Warriors, thank you for letting me take part in saving veterans lives. 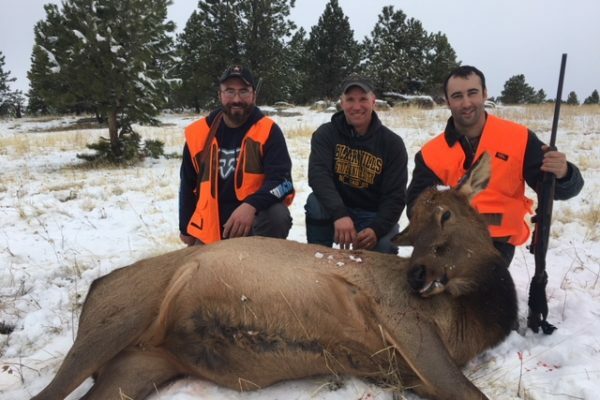 Montana Wounded Warriors Jake Parker, Bruce Maybon, and Larry Lumly, along with board member Bob Lilienthal were once again welcomed to the N-Bar Ranch for the opportunity to pursue elk. 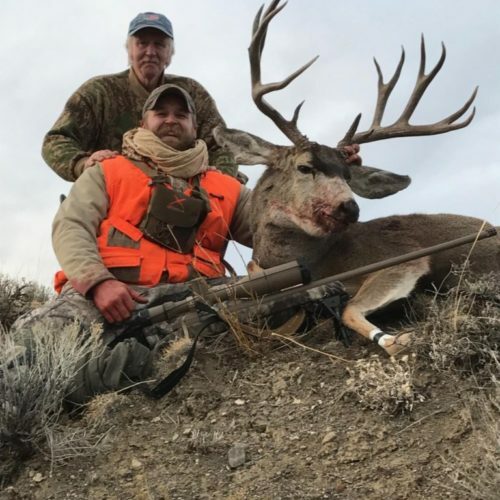 The generosity, hospitality, and professionalism provided by the Wilks Brothers and family, owners of the N-Bar, and carried out by Ranch Manager Mike Sedgwick, wife Mary Beth, and guides Shawn and Dale, are second to none and provide our hunters with a truly unique experience. 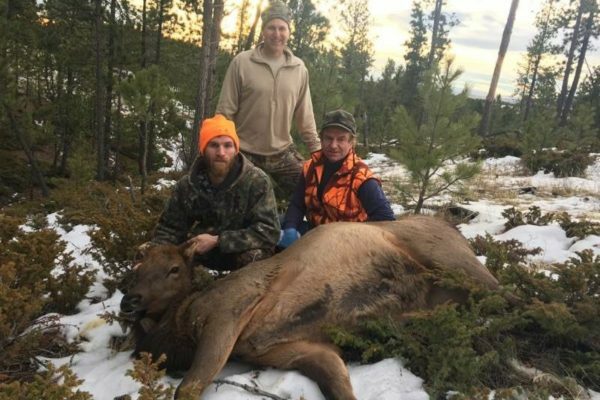 All three hunters were able to harvest elk under the guidance of Mike, Shawn, and Dale, whose knowledge of the Ranch and its wildlife is truly amazing. 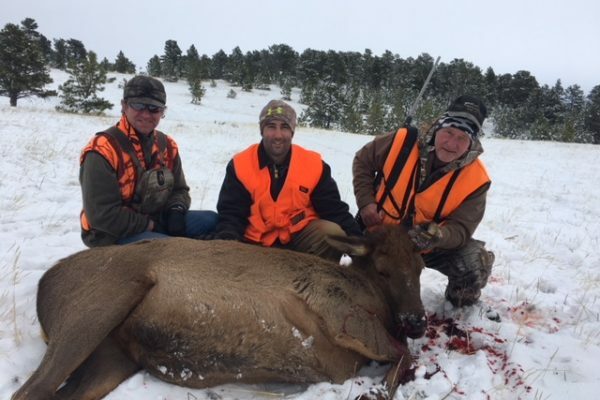 Our organization is truly blessed to have the opportunity to hunt this area, and Jake, Larry, and Bruce were very enthused to be able to partake of the hunt. 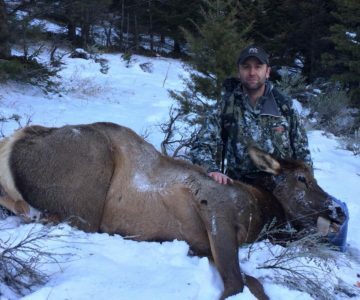 The Ranch also was kind enough to let Montana Wounded Warriors Raffle off cow elk hunts as a fundraiser, which was a huge success. The accommodations, food, and hospitality were wonderful, and thoroughly enjoyed by all. Again,a huge thanks to the owners and staff of the N-Bar for their kindness, and generosity. 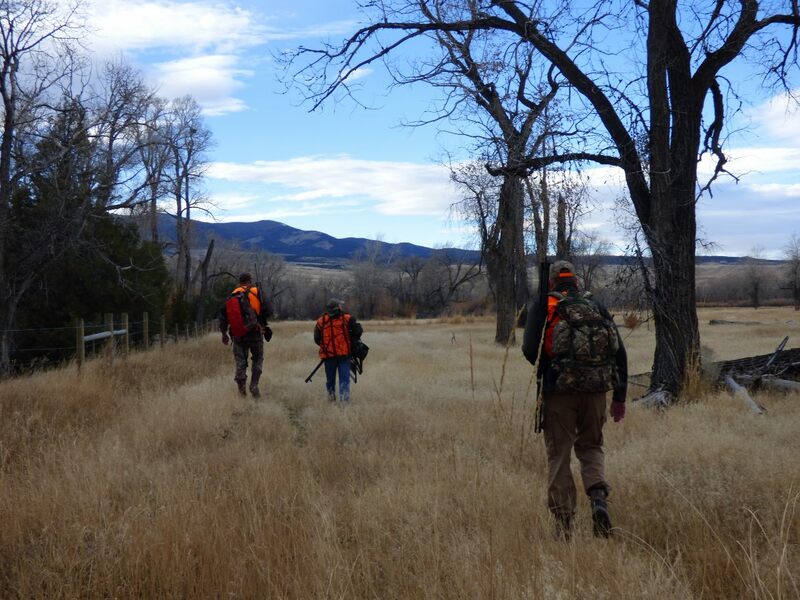 On November 16-18 we set out for the N Bar Ranch once again. What a great trip! Thanks so much to the Wilks Family and all the great staff!!! Mike, Mary Beth, Ryan, Dale, Sean, and all the others behind the scenes!!! 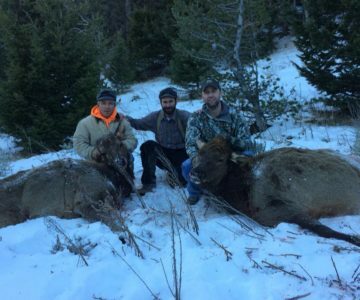 We had three awesome warriors, Howie Copple, Jeremiah Wright and Chase Giacomo, who had never shot an elk. 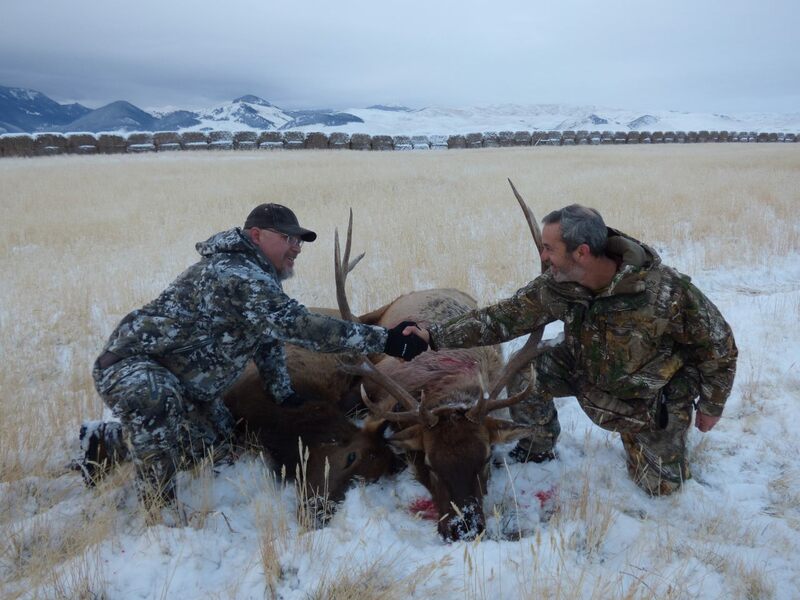 We got it done with the help of the ranch expert assistance in only a few days! What a wonderful time. 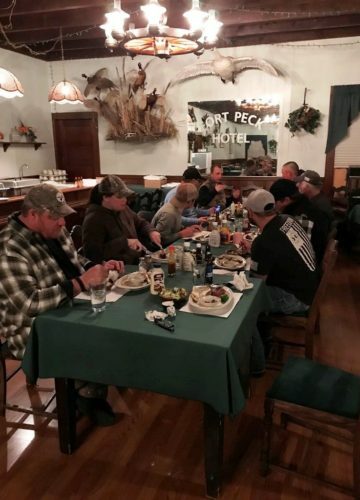 They were all so kind, made us feel at home, and it could not have been possible without the Ranch’s kind and generous selfless service to our Veterans! 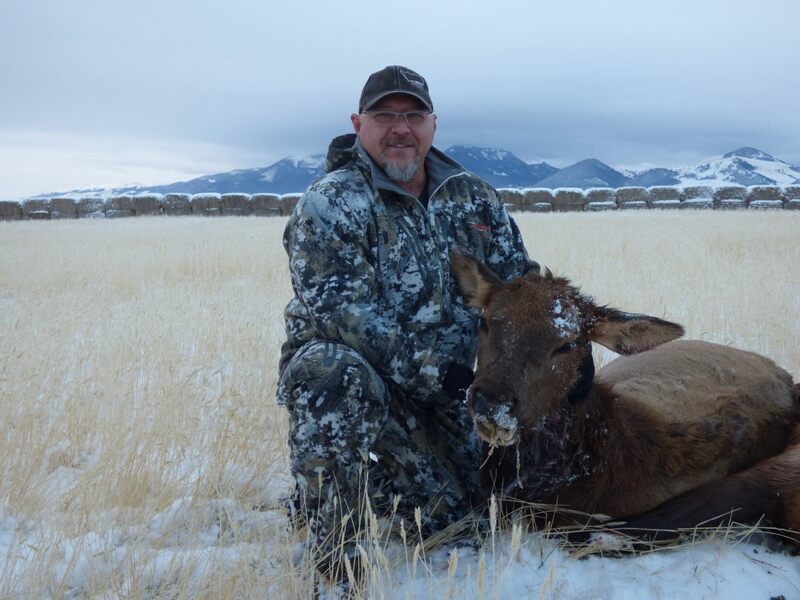 The NBAR shoulder hunt was one of the most incredible hunts I have ever been on. 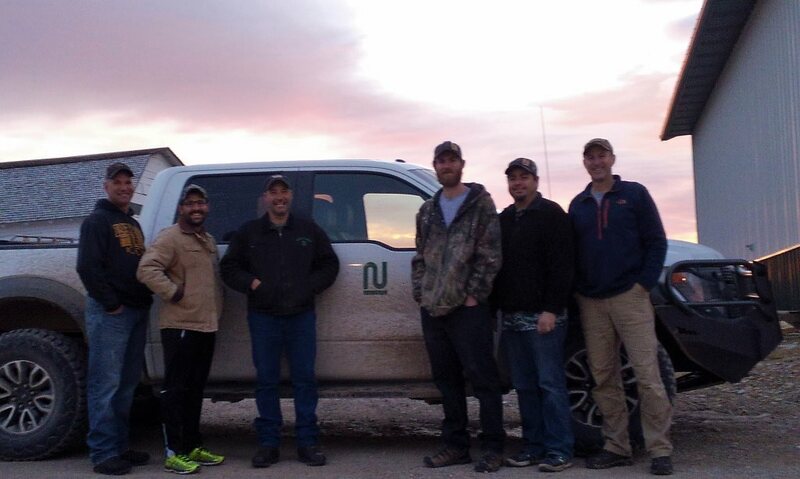 The landscape was beautiful, the ranch hosts were wonderful and the Vets were so deserving of this opportunity. 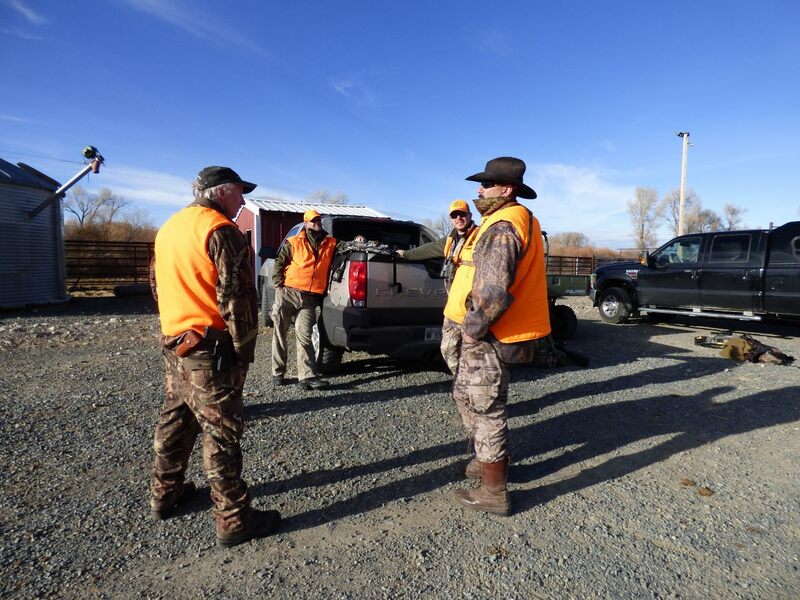 As soon we got to the ranch we all got changed into our hunting gear and headed out. 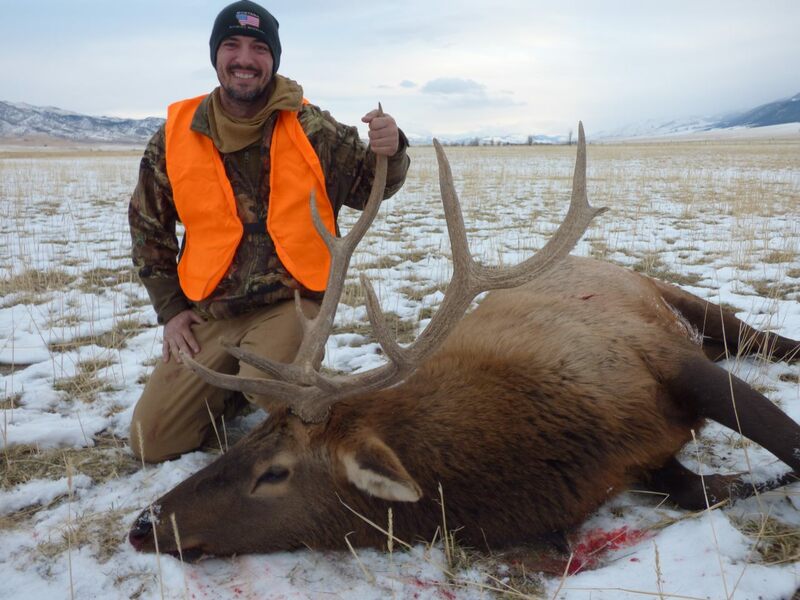 Within minutes of hiking we saw our first large herd of elk. It was magical seeing a herd of hundreds, listening to them talk and mil around the property. 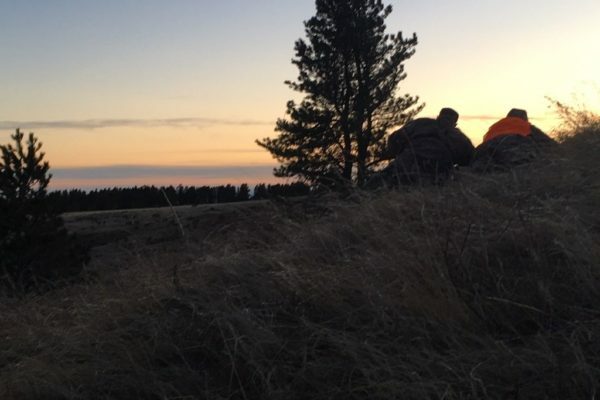 We watched the elk from about 400 yards away as the sun set in the background. It was a great end to a perfect first evening of hunt. The next morning we were greeted at the house and headed out to start the first full day of hunting. 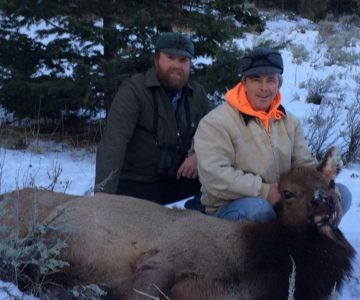 It wasn’t too long that we had got into position to harvest our first elk. 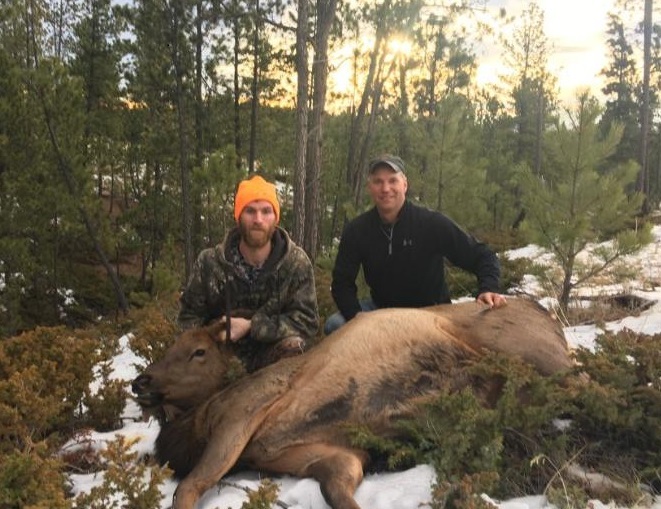 Brock O’Hara made a great shot and harvested his first ever elk. The other two wounded warriors, Dustin Anderson and Chuck Williams, would follow soon after. 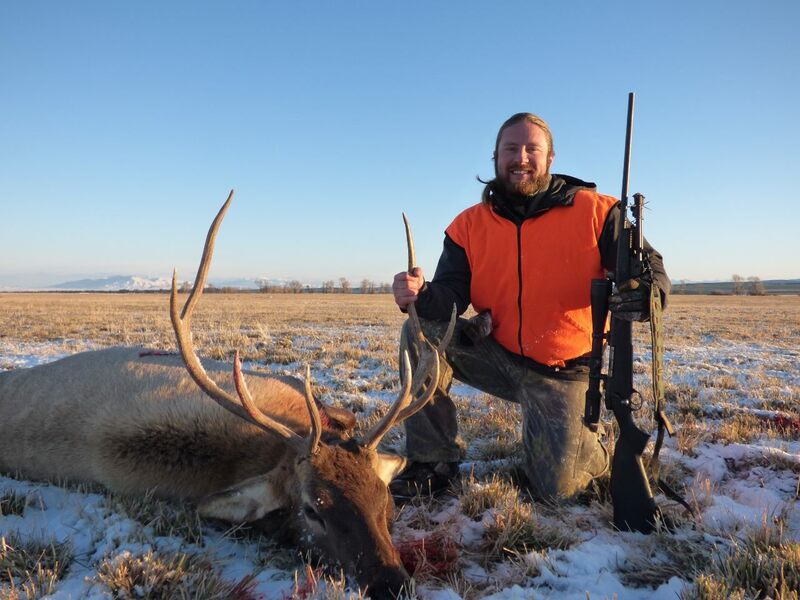 As we drove around the ranch we saw all types of wildlife from mule deer, to antelope, massive bull elk and even a mountain lion. 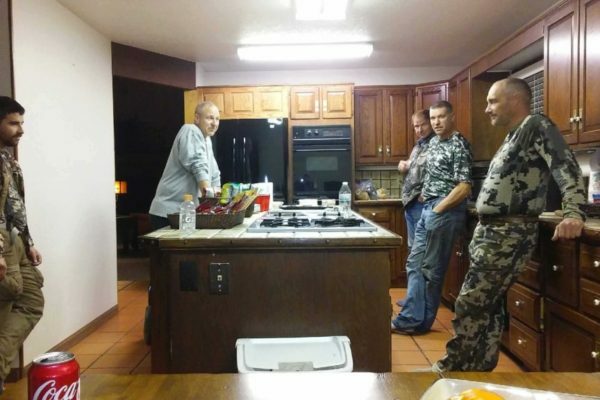 The NBAR ranch is a perfect area for our wounded warriors to gather and have a place to bond in a beautiful and relaxed setting. 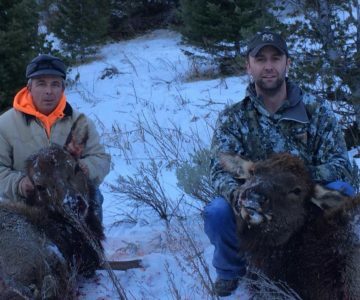 Two of the three wounded had never harvested an elk before. 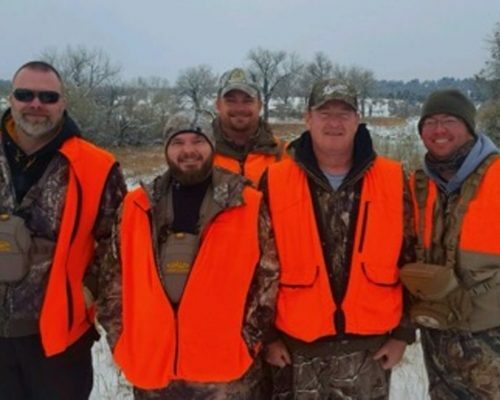 There were tons of smiles and laughter later that evening while discussing the day of hunting and telling all of our stories. 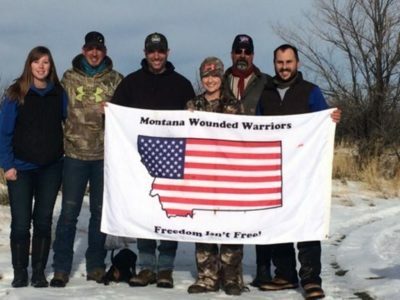 A sincere thanks to the NBAR ranch and all those who helped in making this possible for the Montana Wounded Warriors. 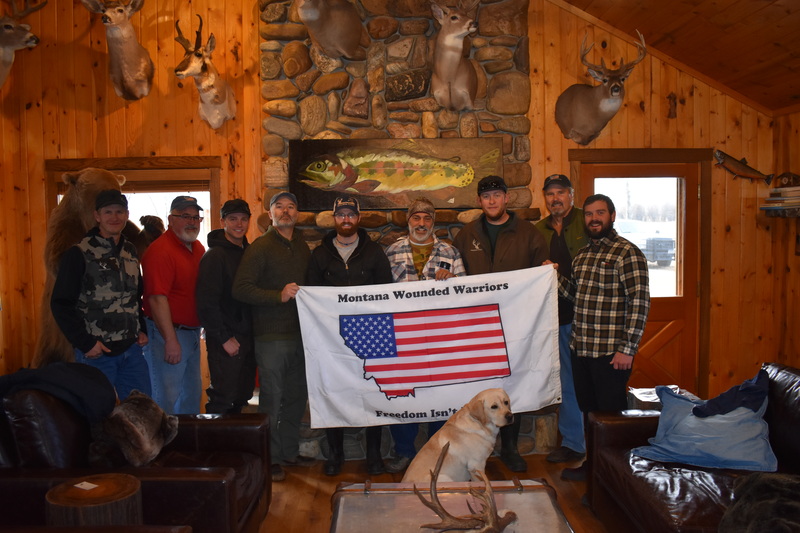 We had a great group of Montana Wounded Warriors that participated in our Mule Deer hunt at Fort Peck Hotel in November of 2017. They included Elizabeth Regland, Kyle Seabourn, Dev Stutsman, Jim Lish and Tyler Hiltner along with MTWW board assistant Fred Ricketts. 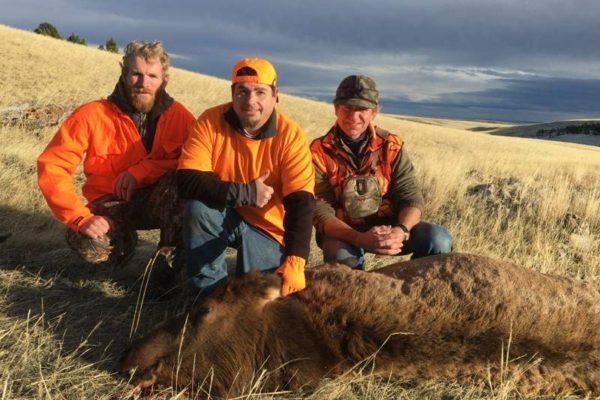 Our host was Carl Mann, the owner of the Fort Peck Hotel, and the 3 guides – Dylan, Jeremy and Dennis – that assisted our hunters on an excellent hunt. 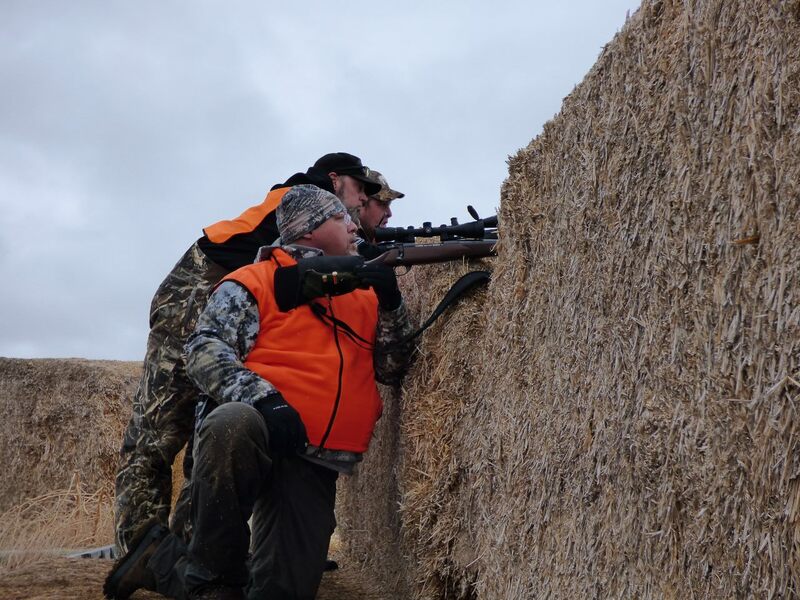 The weather did not cooperate on Saturday the 1st day of our hunt, but our group hunted all day in the cold 10 – 15 degrees and 20 + mph wind that chilled you to the bone. Deer were bedded down and hard to find that Saturday and at dinner we all talked about seeing tracks but not seeing any deer. 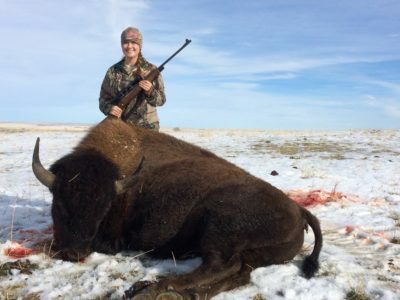 Then, around 6:00 pm as we were eating dinner, in walks Elisabeth (our only woman hunter) who had hunted all day with Dylan one of the great guides. 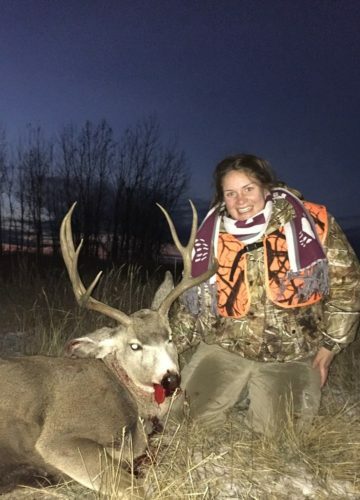 We were all excited to find out she had shot her 1st buck late that afternoon. Wow, we were impressed. Sunday the weather got better. 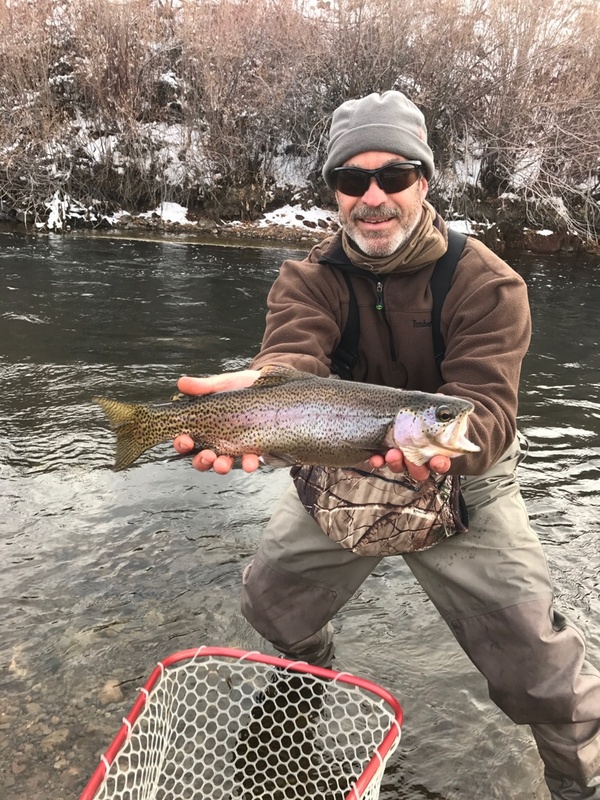 It was only 8 degrees starting out, but no wind to speak off. 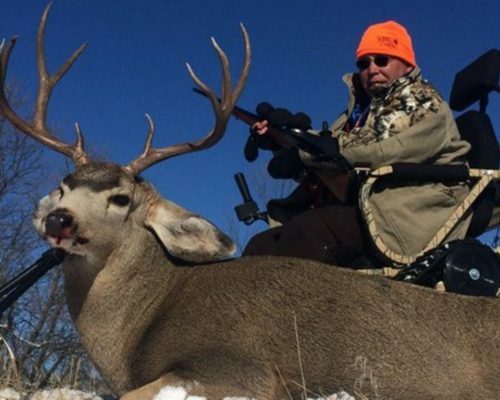 Several hunters were successful and/or at least got a shot or two at some bucks. 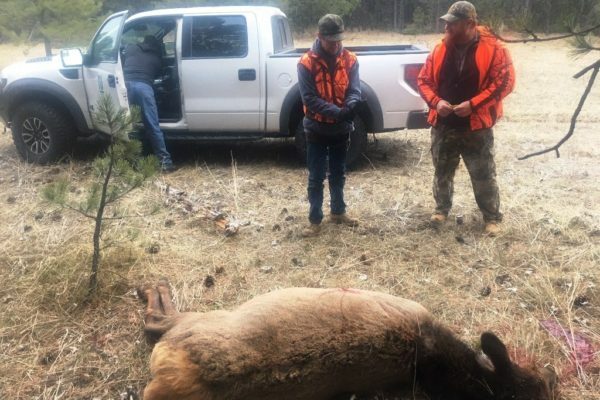 By Tuesday our last hunting day everyone had gotten a buck. 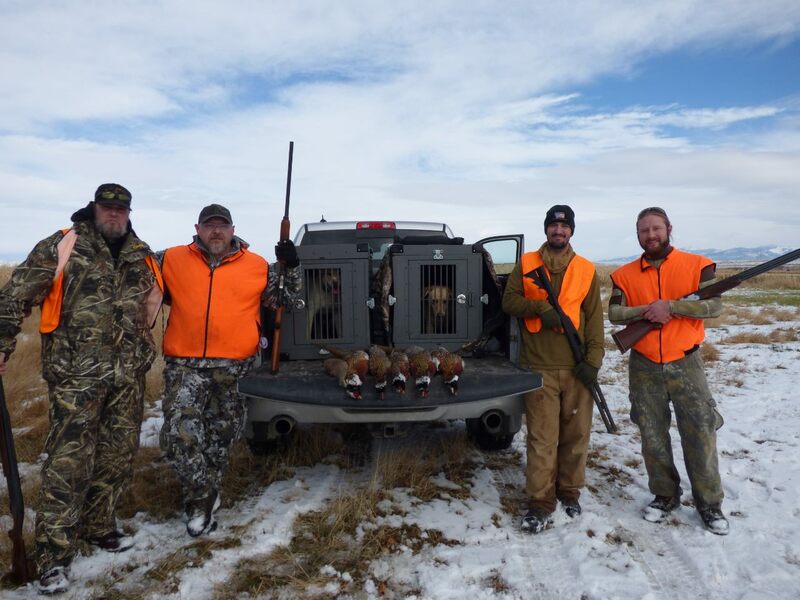 Carl and some of the guides took a few of our vets out for pheasant and/or ducks and geese which was a great addition to the hunt. Everyone had a great trip spending time with each other and enjoying the hospitality of Carl and Linda. Special thanks to Linda who was up each day at 4:00 am cooking breakfast for the whole group. 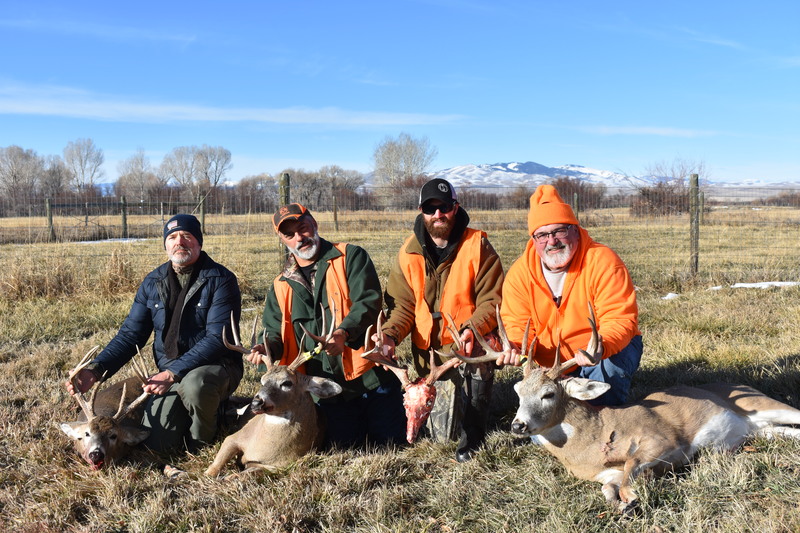 Once again we had the privilege of bringing five wounded veterans (Rodney Thurman, Rick Heilman, Scott Larkin, Tyler Tummons, and Johnny Biers) to hunt deer and elk in Dillon, MT. This year we had the opportunity to stay at the Expedition Lodge and the accommodations were fantastic! 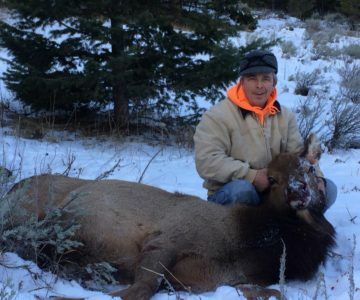 On the afternoon of Friday, November 3rd, our hunt began for deer and elk on the Shuett Ranch as well as the Tash family ranch. 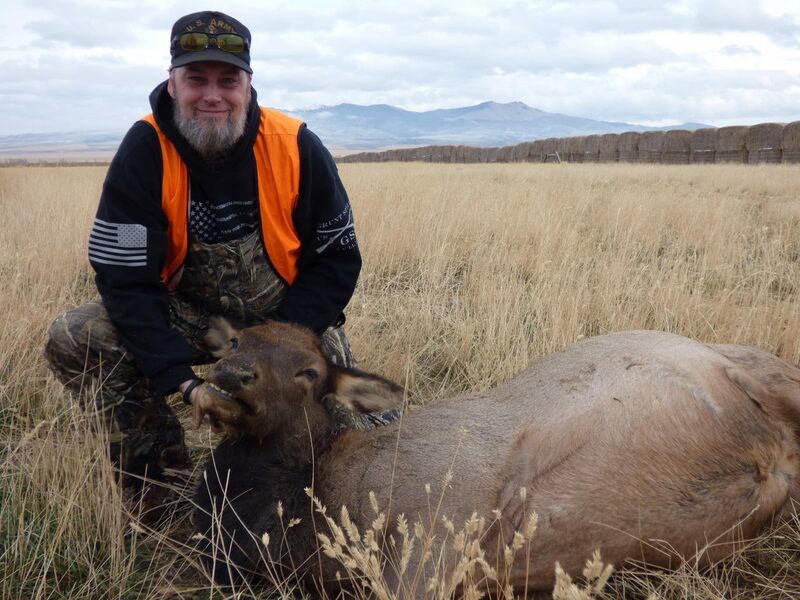 Altogether our veterans harvested 3 bull elk, 2 cow elk, 5 bucks, and 3 does. 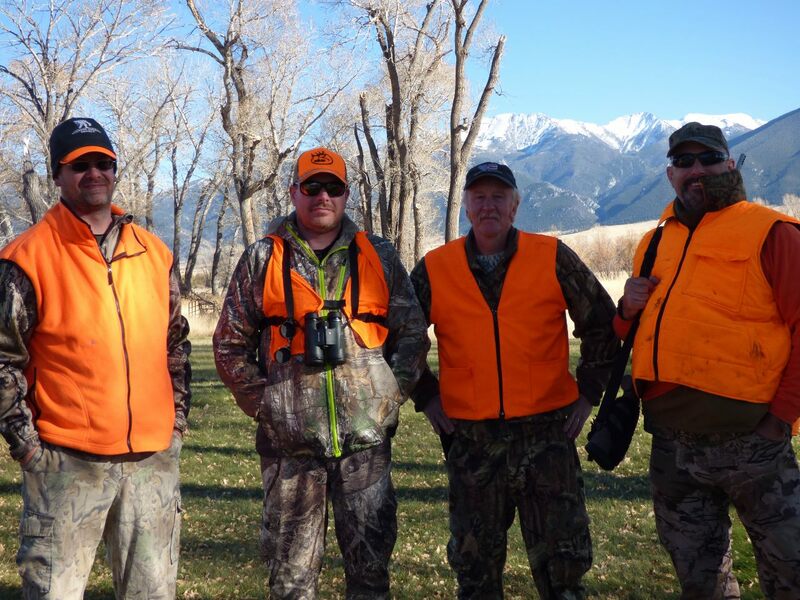 On Sunday afternoon, 4 of the vets were also given the opportunity to hunt pheasants with Bill Kemph. 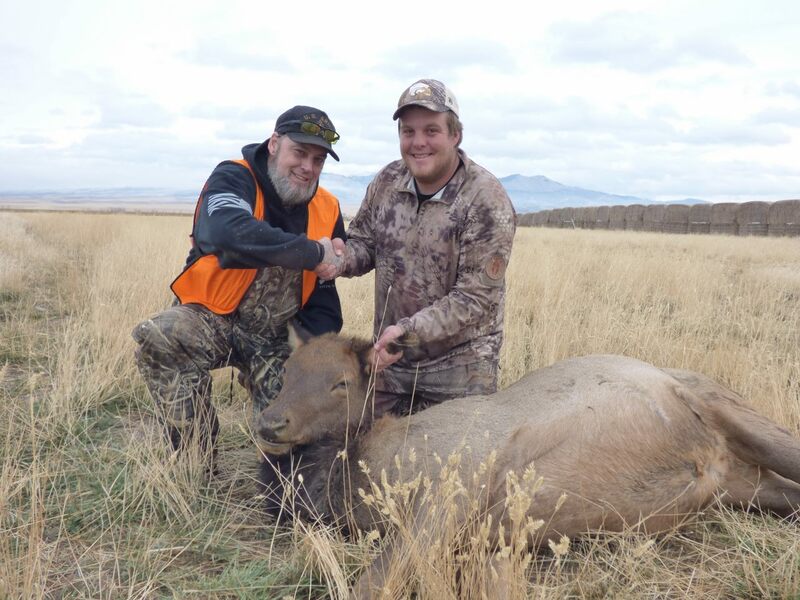 Rodney, who tagged out on Saturday, spent the day on Sunday with guide Cameron Williams. 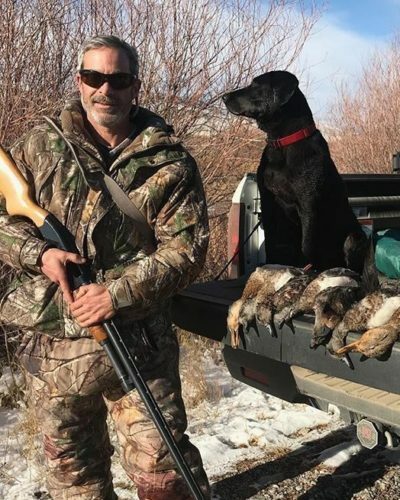 He hunted ducks in the morning (joined by Ed Wilson, co-owner of Expedition Lodge) and fished on the Beaverhead River in the afternoon. The harvest was bountiful! 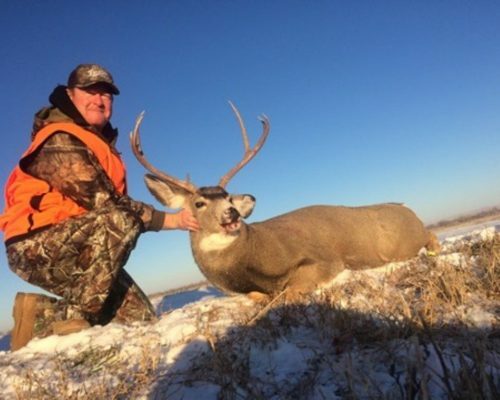 We’d like to thank the Shuett family as well as Tightline Adventures and Expedition Lodge, and the Tash family as well as Torry Holland, the manager of the lands just to the north of Tash’s for his help in allowing us to recover a buck shot on Tash’s, but which jumped the fence before dying. The support of this community is greatly appreciated. 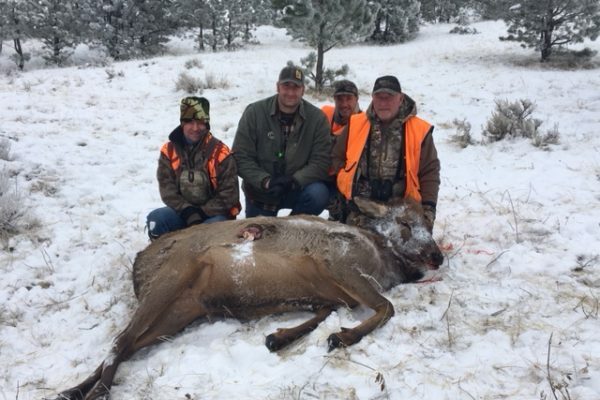 On October 25th Montana Wounded Warriors had the privilege of taking three of our vets to the H Double C Ranch in Silver Star, Montana. 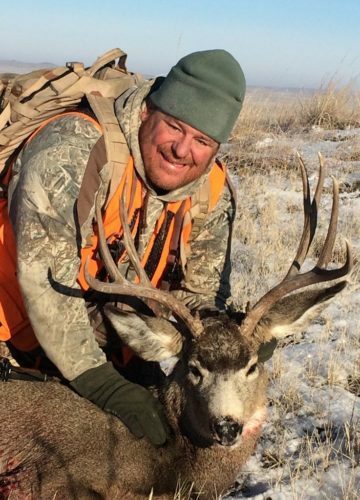 The ranch manager, Mark Hoyt, had contacted us about coming down to hunt whitetails on their property. 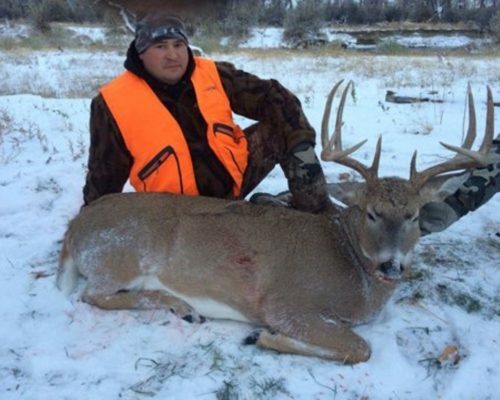 He said there were lots of deer, and he wasn’t kidding!! 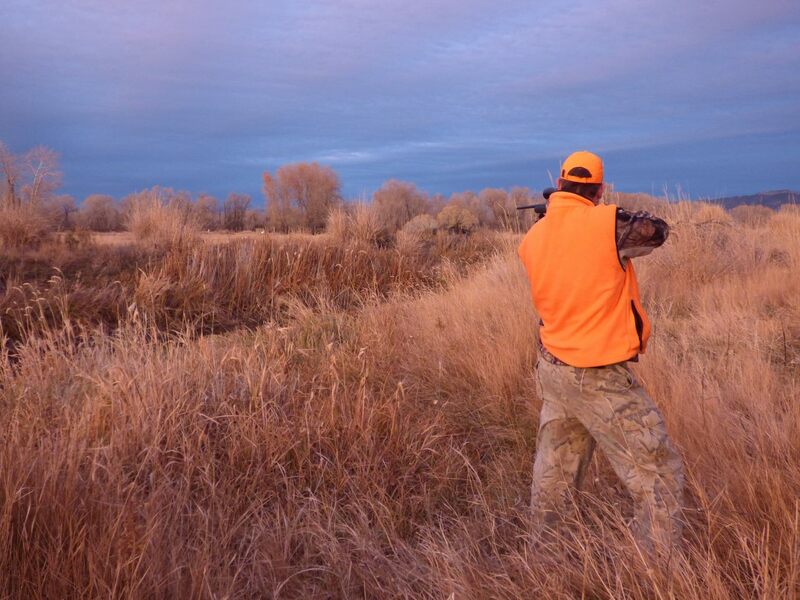 Wednesday night, the first night of the hunt, we began the harvest and it didn’t stop til Friday night. 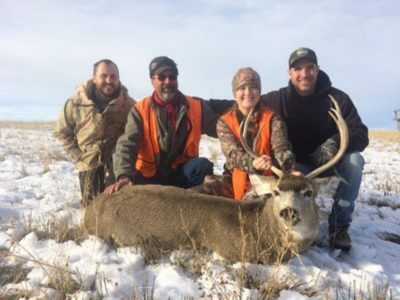 Mark and his wife Kaitlyn and members of the local community acted as our guides to put our vets in position to harvest ten deer, three bucks and seven does. 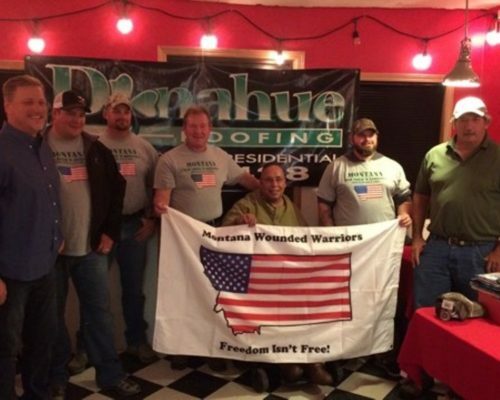 The wounded vets who were able to join us were Chris Mazur, Jon Kristjanson, and Anthony Embesi. The ranch provided lodging in their guest house, which was an awesome place to stay. We would like to thank the entire Hoyt family and members of the community for providing such a wonderful environment for our vets to experience. 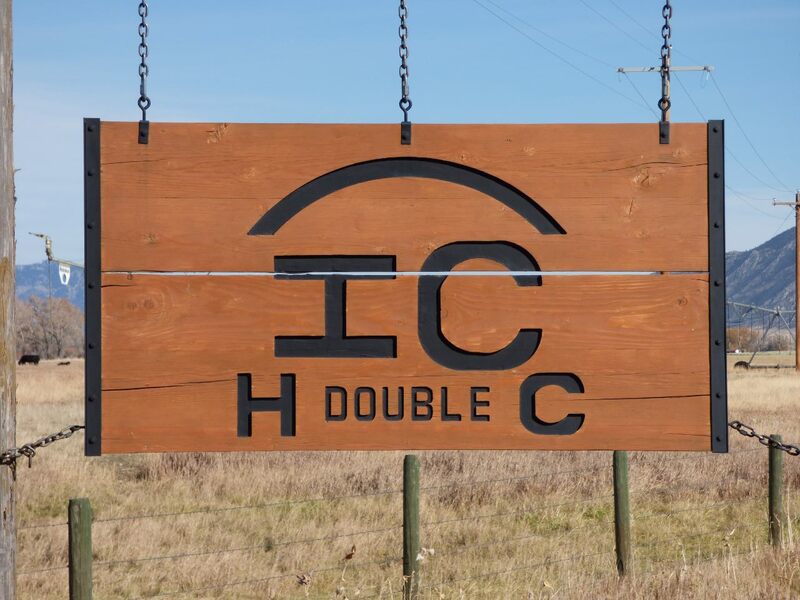 The hospitality was greatly appreciated and we look forward to hunting there in the future.